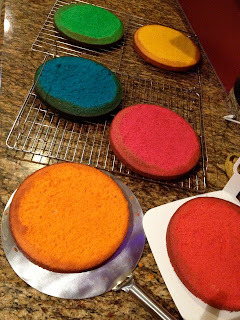 A few weeks ago I made a rainbow checkerboard cake. Inspired by the pretty colours, I made another rainbow cake for a friend's birthday, however this time it was a layer cake. This time the process was much simpler - no circle cutting required! I made six layers as I am lucky enough to own three tins the same size. If you only have one tin, it may take you all day! All you need to do is make a double quantity of butter cake (any recipe will do) then divide it into six bowls. It's better if you are meticulous and weigh each portion to ensure they are the same, otherwise you will end up with wonky layers. 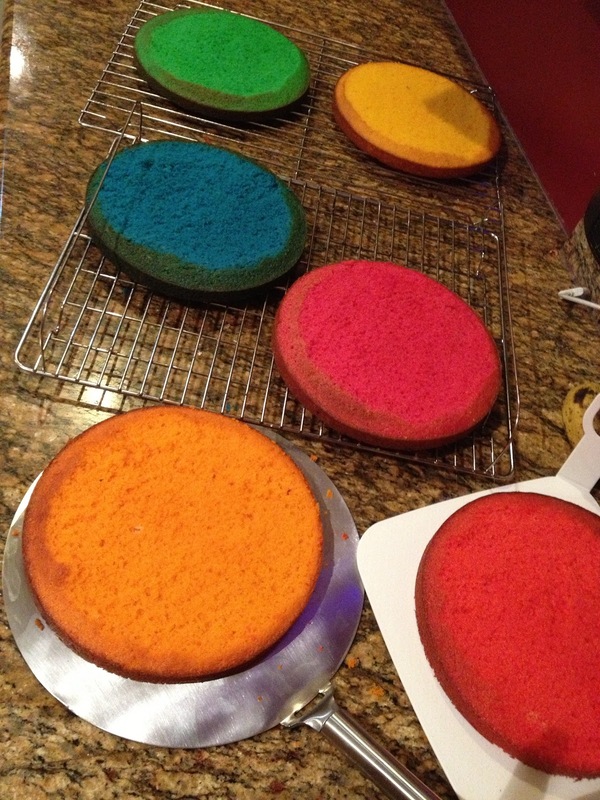 Dye each of the 6 portions a different colour, ensuring they are coloured vibrantly! I use Wilton's gels . Then bake and allow to cool. Place your cake into a large container or something that will catch all the 100's & 1000's that spill everywhere when you coat the cake. Et voila! 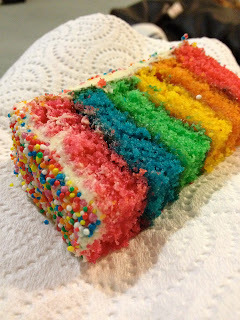 A rainbow cake! After cooking 3 birthday cakes for the same weekend, that's my last birthday cake for awhile now. The Kitchenaid can have a rest now!